LOCATION.--Lat 40`03'00", long 75`01'59", Philadelphia County, Hydrologic Unit 02040202, on left bank at downstream side of footbridge pier, 400 ft downstream from Lower Rhawn Street bridge, and 0.8 mi upstream from Wooden Bridge Run in Philadelphia. PERIOD OF RECORD.--June 1965 to current year. Records for 1971-74 published in WDR PA-81-1. REVISED RECORDS.--WDR PA-81-1: 1974. WDR PA-89-1: 1988. GAGE.--Water-stage recorder and water-quality monitor. Datum of gage is 21.27 ft above National Geodetic Vertical Datum of 1929. Satellite telemetry at station. COOPERATION.--Station established and maintained by the U.S. Geological Survey. Funding for the operation of this station is provided by the City of Philadelphia, Water Department and the U.S. Geological Survey. 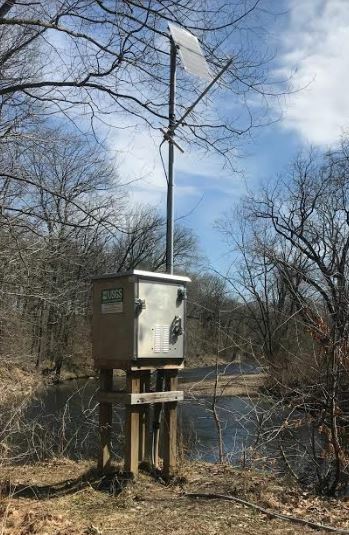 REMARKS.-- Calibration of water-quality instrumentation is conducted exclusively by Philadelphia Water Department personnel with USGS oversight. Erroneous or missing data, resulting from instrument malfunction, are not the responsibility of USGS. Supplied by NWS: Flood stage-7 ft; Moderate flood stage-9 ft; Major flood stage-11 ft.